Pakistan’s greatest ever left arm spinner in the making? Throughout the Faysal Bank Super 8 T20 tournament we have seen left arm spinners being a dominant force with their craft and guile. The likes of Abdur Rehman, Zulfiqar Babar, Azam Hussain, Samiullah are just some of the examples of the most effective bowlers on show, but there is one 18 year olds name & face which has really caught the eye once more in Raza Hasan who was an integral member of Rawalpindi Rams T20 winning triumph. Raza who was a member of the England tour last summer following Danish Kaneria’s axing due to his poor performance at the Trent Brigde test match; only conceded 7 runs during the super over against powerful hitters like Ramiz Raja, Shahzaib & Khalid Latif & demonstrated nerves of steel in a thrilling climax. Formerly, Raza was Pakistan’s joint leading wicket taker at the 2010 ICC under 19 WC in New Zealand where Azeem Ghumman led Pakistan to the final for the 4th time in U19 WCs history. During the televised quarter final, semi final & final Raza was extremely consistent & impressive with his economical & accurate bowling displays as well as his ability to turn the ball prodigiously and mix up his trajectories & pace & flight, cunningly. He was even labelled as the most impressive performer and individual from Pakistan’s team during that event which is no small compliment considering the likes of Ahmed Shehzad, Babar Azam and Hammad Azam were also representing the green shirts during the tournament. Raza was the 2nd leading wicket taker during the Faysal Bank Super 8s T20 tournament and was clearly one of the stand out performers. He claimed the most wickets by a spinner in the tournament as well the most from Rawalpindi’s side. Earlier this year he had the best average in the national one day competition division one for any bowler who had taken over 10 wickets in the tournament including a best 5 wicket haul against WAPDA. He bowls well to both right handers & left handers. He is able to maintain a nagging length as well as being a “thinking” bowler who can work batsmen out. Apparently he can even bowl a left arm doosra which in unheard of. The likes of Ijaz Ahmed have been singing his praises. Raza has compared his style of bowling to Saeed Ajmal & has taken great inspiration from watching videos and footage of Murali. Another aspect which tends to go unnoticed with Raza is he is cool, collective and confident with his ground fielding and catching. He can be regarded as a naturally born athlete & one that can be positioned anywhere by his respective captain. No mug with the willow either, despite what one may think about his last ball swash when the Rams virtually just needed to get bat on ball to secure the win without the need for the superover. However, he mentally came back strong & bowled a champion over in a tense climate. His temperament & ability to react strongly to the situation was undoubtedly evident to all that viewed the match. A quick learner it can be said and a focussed and mature young lad. Raza played in the Devon league last summer along with Hammad Azam before being called up for the Pakistan squad. He was training with the team and played one match for Budleigh Salterton CC where he claimed figures of 12-8-9-5. 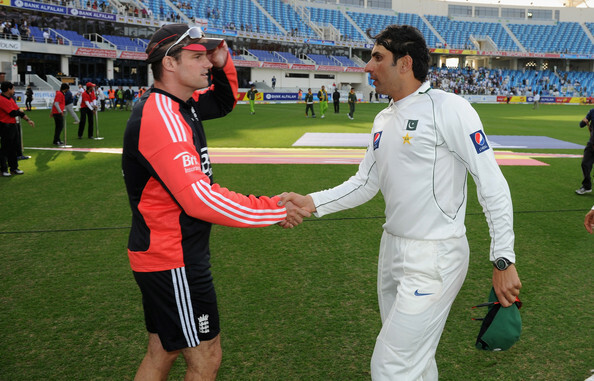 Raza played for Pakistan “A” against England “A” in early 2010 during the 3 match 50 over series in the United Arab Emirates. During the series Raza was Pakistan’s most successful performer claiming 9 wickets for just 73 runs together in the 3 matches. 8 of those 9 wickets were either bowled or LBW which is a minor reflection of the trouble he gave the English batsmen who were far more experienced than him. During the Mens Cricket tournament in China in late 2010 where Pakistan claimed the bronze award Raza ended up with astonishing tournament figures of 7 for 48 from 12 overs. Unfortunately, the batsmen let him down and Khalid Latif’s team could not progress further than the 3rd place play off where they beat Sri Lanka comprehensively in the Asian Games to secure the 3rd place spot. In closing, if his career goes according to plan and he lives up to his potential he is bound to go on and be the most successful left arm spinner Pakistan have ever produced & even up there with other legendary spin acts from Pakistan. I think he will be more suited & most effective in LOIs. A national call up beckons very soon. Another big name in the making to be unleashed from the mysterious world that is Pakistan Cricket. He is no ordinary left arm floater or darter. He is a uniquely gifted teenage spinning demon who can take the world by storm like nothing before. Those that have followed and closely observed his progress cannot help but hype him after what we have seen.